THERE are so many elements that converge in Chryssa Verghi’s art. Among her painted odes to nature, you will spot references to certain crucial crossroads in the history of art and landscape painting, such as her painted encomium to Monet ‘s ‘ Water Lillies’, a touch of Romanticism’s passion for the sublime and mystical in nature, Expressionism’s painterly flair, or even Pollock’s love of paint drops. Nature here is a life giving force to be celebrated and respected – the mother of all things. Verghi captures via paint, how nature can uplift you, embrace you, soothe you, astound you with her colour and light, but then again how she can lure you into dark and dangerous places – musty and dank. After seeing her work, one is almost left with an after taste or an aroma – the musty smell of fig leaves, of damp earth, verdant vegetation or undergrowth feeding off nearby cool ,crystalline waters. The myriads of blues, greens and browns of her larger canvases in particular, play havoc on your eyes, excite the senses, detoxify the mind and boldly confront you with a powerful force. Despite the crisis, 2015 has been a good year for this artist, whose paintings for many were the main highlight at the Art Athina art fair in May, where they featured in a solo show at Alpha C.K. Art Gallery’s stand. 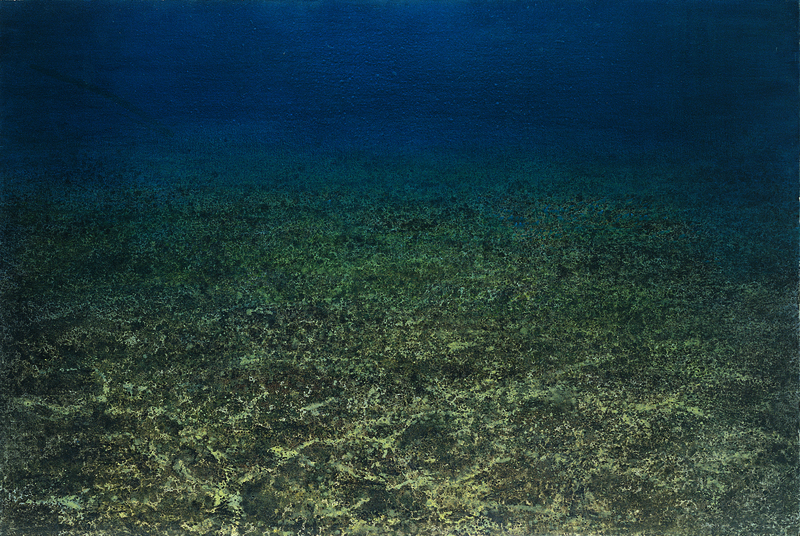 Verghi also exhibited at London’s Belgravia Gallery, in their ‘Spring Exhibition’, while the Greek summer rewarded her with the pinnacle of her artistic career so far – her retrospective at Syros’ Cyclades Pinacotheque, spanning three decades of her work (1985-2015), entitled ‘Chryssa Verghi: The Soul of the Landscape’. Her current show at the Evripides Gallery in Kolonaki (10 Iraklitou St, tel 210-361-5909, running till October 17) includes a selection of those works , with a few other additions. Yet despite the crisis, some art lovers have tried to keep the creative flame alive in the heart of Athens. While some gallery doors close, others open – such as those of the Evripides Gallery (www.evripides-art.gr). This new gallery is situated in the building once known as the ’House of Cyprus’ – a cultural establishment which had also offered much to the community, before it closed. Businessman and art collector Kostas Evripides together with his wife Nasia, have given new life to the building with their gallery. Mr Evripides and his wife have been collecting Greek art for the past 20 years. The 3-storey, 600 m2 art space first opened its doors to the public in June, with an exhibition of works by Yiannis Spyropoulos. 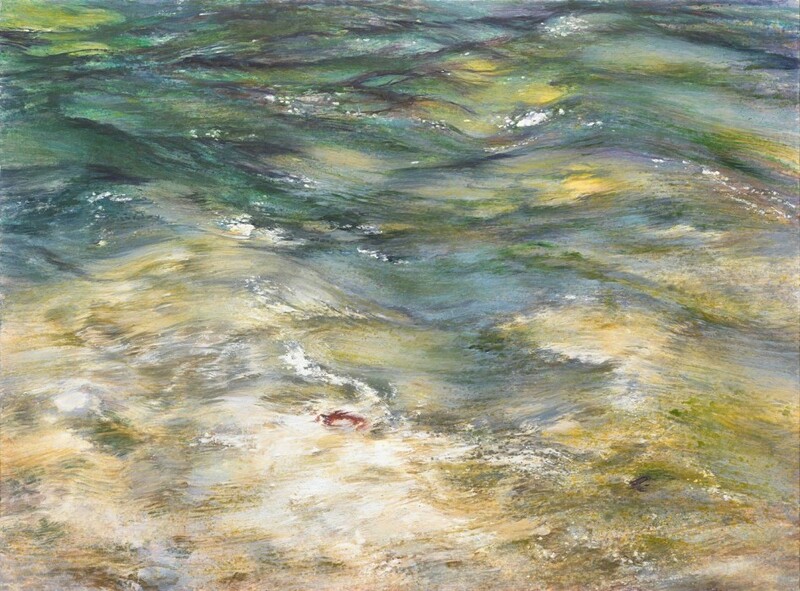 Verghi is a plein air painter – a cumbersome practice, which involves taking her large canvases with her on the beach or by the river, working outdoors in order to become one with her natural environ. She told ‘Art Scene Athens’ about her unique artistic process, which usually begins after 3pm, when the light is steadier: “The conditions for creating my work outdoors are totally different from those in the studio. When working in nature, I take with me nothing more than just the colours and the rolled up canvas, which I then spread on the ground. These primordial conditions can hide some unforeseen outcomes. Over the years I have discovered means and techniques in order to realise my creative process under the given circumstances. I work quickly, so that I can catch the light and my feelings. I paint on large surfaces via a gestural manner , trying thus to interpret artistically the feeling which overcomes me when I am engaged in my subject. In the last few years, I have been finishing off the works in the studio, choosing in this way to distance myself from nature, and to focus on the work’s essential elements. This has also lead me towards creating more abstract works.” The artist adds that it can take her months, even years to complete a work and that she works on various paintings at the same time. Some of Verghi’s canvases combine acute focus on detail in some parts, with total abstraction in others. 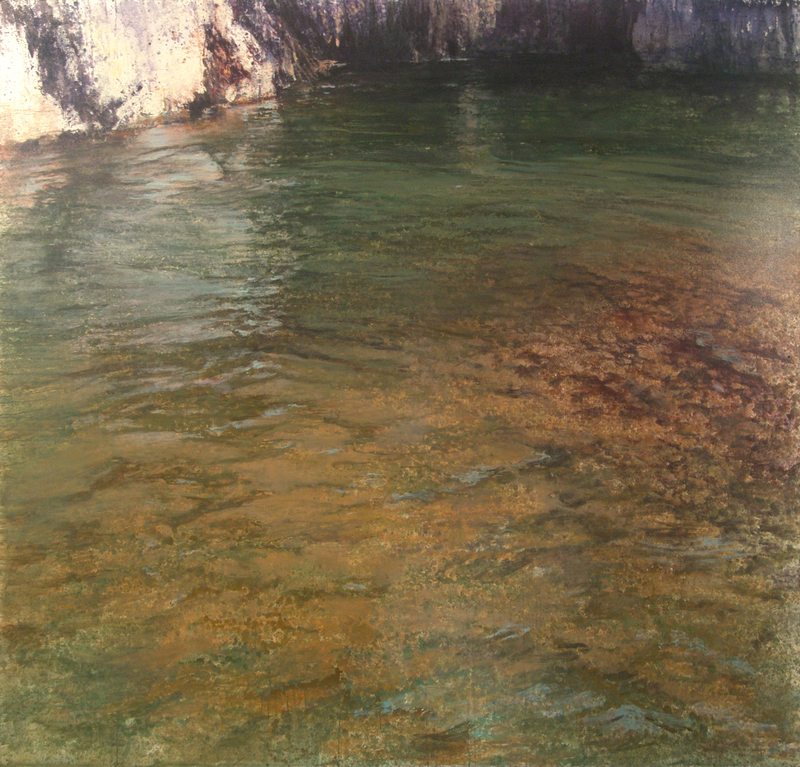 One could say that a viewer’s eye travels over a landscape in a similar fashion, vaguely focusing on the uninteresting before choosing to investigate more interesting factors that will catch his/her attention: the mesmerising ripples and reflections on the sea’s surface, or the curvaceous leaves of a fig tree, dappled by the light . But Verghi’s son seems to have been the only real human ‘distraction’, from her main aim to capture nature in all its grace and grandeur . Her landscapes are ‘archetypal’ – this is what the land was like ‘in the beginning’ , untouched by the human hand, pure. People do appear sometimes (small figures), in order to create a scale of things – as a metre of measure. The artist points out though that her works might be without people, but they are not without life. The people might be missing, but this does not mean her work is not about the human experience of nature, of life and its cycles. Verghi’s ecological conscience in the past also led her to donate one of her works to auction in order to raise money for the National Forest Fund, as part of the Environmental Programme of the Goulandris Museum of Natural History (in 2008). The work, estimated at 22,000 euros, finally sold for 30,000 euros and was bought by the Greek State. It is now housed in the Greek Parliament. The money was used to buy fire trucks for the fire brigade. I leave you with some impressions from my experience of her current show, which is a must-see: This is not the white, dazzling light of Greece that we see in her works, but a more dissipated, soft light, sometimes a tad dusky and mellow. Brushstrokes and landscape play tricks on each other – speckles of paint become the faded glitter of light on water, large blue surfaces wash away the stress, while crusty brown impasto brings us down to earth in other works. There is texture, colour, emotion and history. But what prevails the most (in my humble opinion), is the artist’s sheer love of nature, and the human need to be close to nature, to escape there, to discover and learn from its symbolism and laws. This is what Verghi manages to pass on to the viewer – that impulsive instinct, that necessary connection between the human and nature, which is as important as the grandest cultural heirloom, that must be preserved and not lost. Tags: art, athens, creativity, greece, painting. Bookmark the permalink.